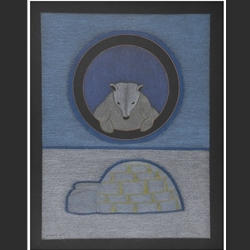 This collection of modern Inuit drawings features a remarkable variety of subjects and styles. Qavavau Manumie’s finely executed drawings differ from each other stylistically: In the diptych 35, the artist has drawn a polar bear looking through a porthole down on an isolated igloo and made an ironic comment on the usual human-bear relationship. Drawing 82 is a more classical work - symbolizing spring, a dainty, colorful bird holds a decorative leaf in its beak. Tim Pitsiulak’s two pieces are masterworks of realistic drawing. Both depict specific moments in time. Drawing 83 captures the fluid movement of a walrus during just a split second of its life deep in the sea, with strong lines and voluptuous shading. In “Shedding Velvet”, the artist expresses a humorous perspective on the caribou’s annual loss of its antlers, highlighting a temporary, intricate stance with deft pencil strokes. Jutai Toonoo’s bold semi-abstract style has produced a striking portrait of an Inuk, in "Sun Burnt". "Music" uses vibrantly colored lines to create a scintillating symbolic guitar which plays a heartfelt love song. Vibrating lines envelope the guitar, merging with it. Drawing 79 by Ningeokuluk Teevee communicates a cosmological meaning. A contemplative bird is perched on the cusp of a volcanic globe and a full moon is reflected in its oceans; the bird casts a shadow between itself and the reflected moon. Ningeokuluk's drawing “Raven Transformer” exemplifies the Inuit belief in the power of shamans to transform into fauna, in order to mediate for people between their troubled earthly situations and helping spirits. “My Old Amautic” by Shuvinai Ashoona combines the subject of a woman’s traditional form of outerwear with modern designs, featuring forms of shelter in nomadic times and a few mysterious planets. In “Tea Break after Berry Picking”, in an abstract manner Nicotye Samayualie lays out a number of basic kitchen elements around an enormous basket of freshly picked berries, above which hover mugs of piping hot tea. In Cee Pootoogook’s fantasy drawing, “Fishing Bears”, three polar bears float gracefully among schools of arctic fish, in what must be a dream come true for them. Drawing 80 by Malaija Pootoogook is a warm, comforting image of the mother-and-child archetype, which this happy pair of owls illustrates. Her drawing 84 embellishes on the maternal theme: a large bird protects little chicks with her generously outspread wings.